This Non-Smoking, two bedroom, 2 bath beach retreat is on the top floor (sixth level) and faces the Gulf of Mexico from a beautiful angle with spectacular views of the Gulf, John's Pass, and Village, and the bay with the Tropicana Dome in the far distance. Professionally decorated, this condo will make you feel at home. Luxury linens, custom window coverings, high speed wireless internet and cable TV are just a few of the amenities this vacation retreat has to offer. On the South side, the condo has a long balcony off the master bedroom and living room that allows beautiful sunrise views. Within walking distance are shopping, Florida wine tasting, Casino Cruises, Sunset Cruises, Boat rentals, wave runners, para sailing, restaurants, shopping and more. This almost 1,000 square foot, quiet condo has all new appliances, flat screen tvs, and is set up for complete cooking, serving, and dining. Bathrooms are stocked with hair dryers. The building is totally renovated and updated with key entry required for access to elevators, stairwells, and beach with key access for guests. There is a private mailbox for the unit. It is 30 miles from the Tampa Airport, 15 miles from the St Pete airport and 100 miles from Disney World and Epcot. The sugary white sand is soft and gentle and the beach area deep and wide with a private atmosphere. The sunsets are breathtaking and wildlife abounds. You will often see dolphins playing just outside the swim area in the evening or early morning. Newly renovated in Dec 2013. New Granite, tile, vanities, fixtures! South facing unit. Views of Gulf and Intracoastal. Reserved parking space as well as guest parking. Owners Dave and Therese are wonderful to work with! They are very prompt to answer any questions we have during the stay. Beautiful condo, great location. Condo is well stocked and very clean. Had a great time! We will be back! 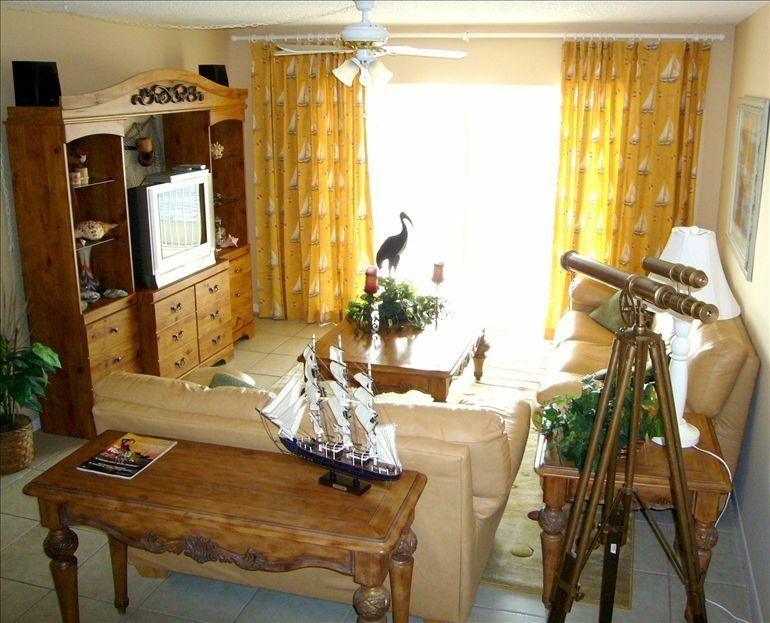 The condo was exactly as shown in the photographs with very comfortable furnishings. Everything we needed was included and all items were in very good working order. The large balcony was our afternoon retreat after days out in the Florida sun. It was nice to have an outdoor spot that provided great bay and ocean views but was still protected from the winds as well as the hot afternoon sun. The kitchen might be a bit small for a larger family's needs but it worked very well for us as a couple. Dave and Therese were very responsive when we booked and when we emailed to ask a quick question. The nearby trolley stop made the entire beachfront from Clearwater to St. Pete easily accessible. For an affordable and comfortable beach getaway within walking distance of John's Pass and all it has to offer, we recommend this spot! We thoroughly enjoyed our recent trip. The condo was very nice with lots of items that is needed on a beach vaca i.e., beach chairs, umbrella, balls, floaties etc. Our granddaughters love the whole experience. We will definitely stay again.. Thanks Therese and Dave!!! Partial beach views, could hear the surf, see the waves and the draw bridge! All amenities were provided - great time!! We just stayed there at the condo from june 23-30 for a much needed family vacation the beds were truly amazing so comfortable.The views were awesome off that great balcony of the gulf and johns pass .Great location .Walking distance to alot of stuff .we had a blast and I normally dont do reviews .Missing it already.Oh yea if u like oreos go to the boardwalk grill try fried oreos there very good. Thanks for allowing us to use your beautiful beach home . Rates are subject to change until booking confirmed. Refundable damage deposit is $250 FOR EACH WEEK OF STAY and is due immediately in addition to vrbo fee to confirm booking. Discount rates possible for longer stays. Usually Sat-Sat booking.